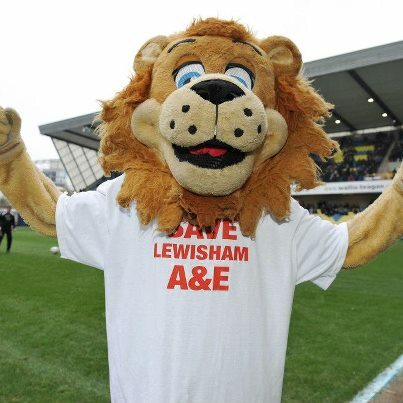 Official Save Lewisham A&E single out now! Lewisham rapper Question has recorded a tune with the Lewisham NHS Choir and record producer Charles Bailey as an inspirational track "to help fight the cause, raise awareness and support the movement". 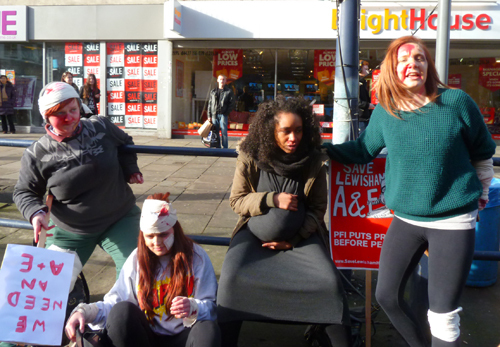 Save Lewisham A&E is the official Save Lewisham A&E campaign single released yesterday and available on iTunes. Check the YouTube page for full credits of everyone involved. Download the track. There are three versions to choose from – it's only 79p per track, or £2.37 for all three. Play it LOUD...! 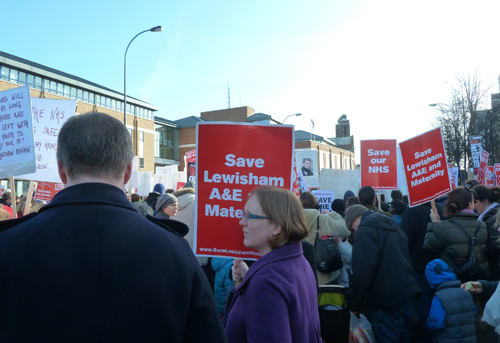 Also see East London Lines story "Mayor threatens legal fight over Lewisham A&E". This story indicates that Hunt's announcement will be Thursday morning, not Friday. See previous post. Mr Hunt has recommended Kershaw's proposals. (See The Guardian's live blog). He inaccurately states journey times will only increase by a minute, and that no other proposals have been forthcoming. A&E will be downgraded and high risk maternity cases will have to travel further. 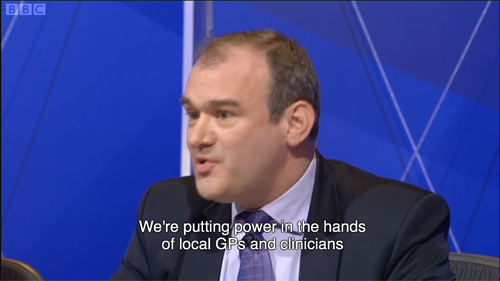 Shadow health minister Burnham asked if Hunt is confident these measures are legal – will he publish his legal advice? "There has been a 'scandalous waste of money' on a solution that will not be acceptable to the people of Lewisham". 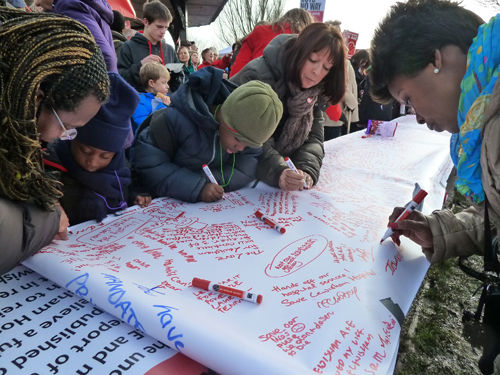 Read the latest statement from Save Lewisham Hospital in which it describes the news as a 'deadly decision'. 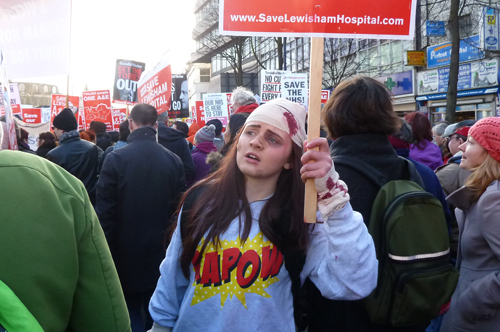 "The recommendation to close Lewisham A&E is part of an ideological assault on the NHS. 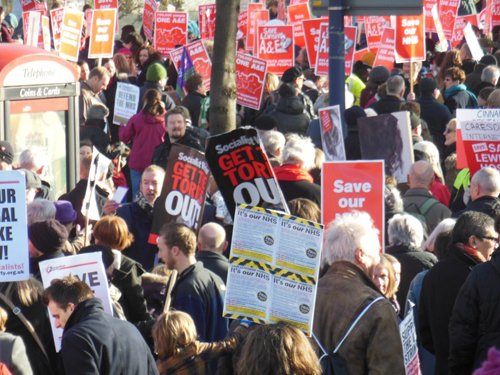 The administrator’s plans to make cuts and close local competitors is designed to make South London’s services more attractive to private healthcare. 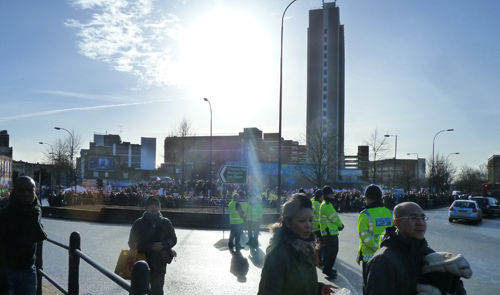 Although some NHS Trusts have expressed an interest in running South London’s services, so have many private companies. 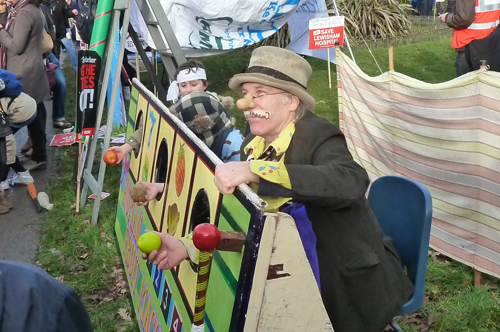 The tendering process will be overseen by Jeremy Hunt, not the administrator. It is likely to be focussed on cost and servicing the debt, rather than quality. So although headlines are focussed on local trusts, private health companies are at an advantage when they compete on cost, because they don’t bear the costs of A&E’s, intensive care, or training medical professionals." 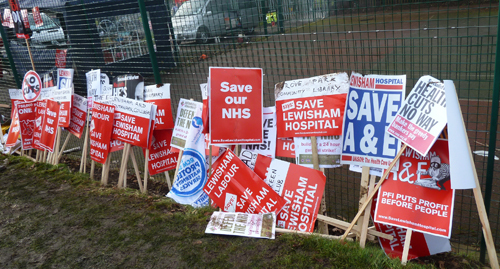 There will be a rally outside Lewisham Hospital tonight at 6pm. 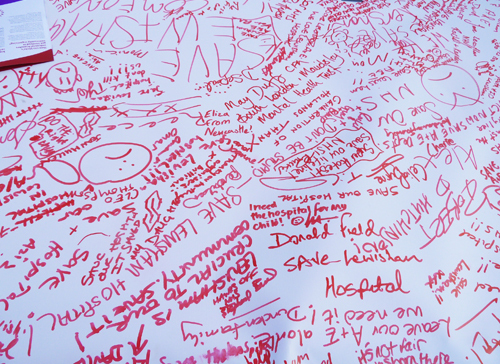 In the week that ends with Jeremy Hunt's decision on the future of Lewisham Hospital, the Save Lewisham Hospital campaign will be handing in petitions – including the 100ft one created at the demonstration on Saturday – at the Department of Health on Wednesday 30th January, 10am-12noon. 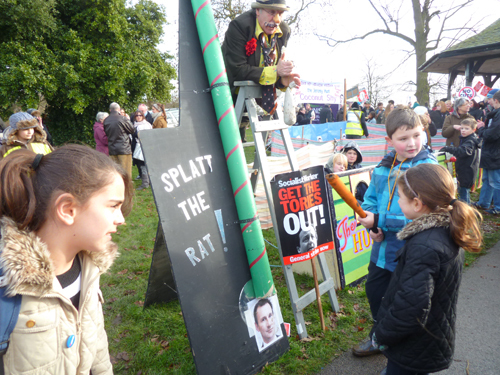 On Friday 1st February at 6pm there will be a rally outside the hospital to coincide with Hunt's announcement. Everyone who has time is welcome to join in both events. 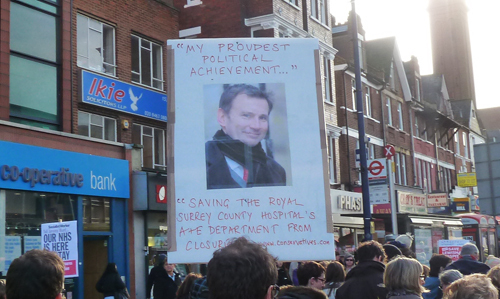 It is believed Jeremy Hunt may make his announcement regarding Lewisham Hospital closures on Thursday 31st January. 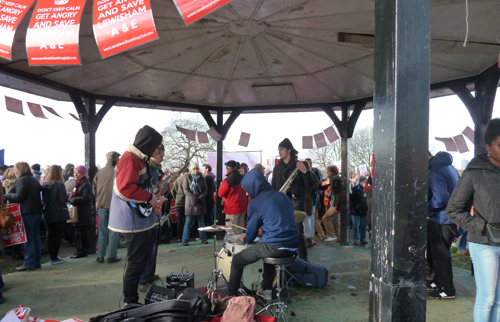 PLEASE LOOK OUT FOR ANNOUNCEMENTS via the Save Lewisham Hospital campaign's Facebook or Twitter pages. DO NOT ASSUME it is tomorrow unless you have heard so through these channels. 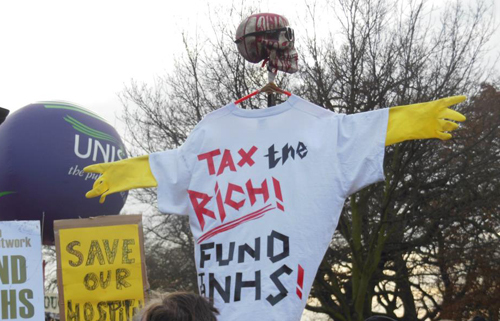 Meet outside Lewisham Hospital at 6PM. 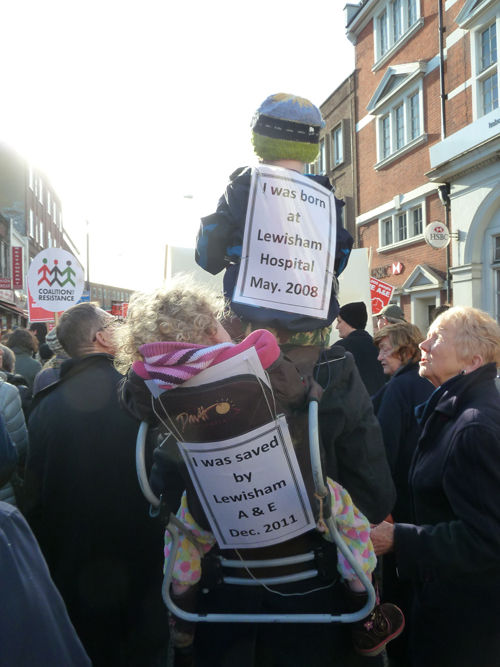 Join the Save Lewisham Hospital campaigners, hospital workers and the community to celebrate OR to hear about next steps for the campaign. IF NOT, we will keep you posted. 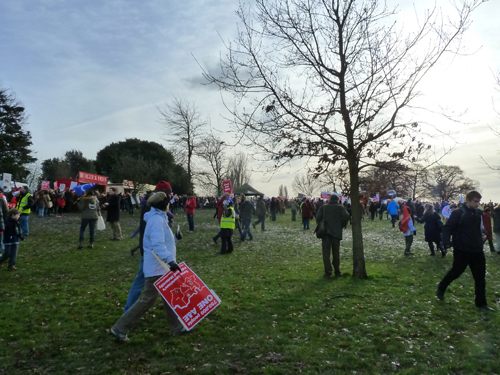 "Today petitions from the incredible public (over 40,000), the 100ft petition with thousands of names from the demo last Saturday and a petition by nearly 400 GPs was handed to Jeremy Hunt, in a last ditch attempt to persuade Hunt to NOT CLOSE crucial Lewisham Hospital departments." Taken from the Notice of Decisions Made by Mayor & Cabinet on 16 January 2013 found on the Agenda page of the Overview and Scrutiny Business Panel, Tuesday 29th January 2013. These decisions will become effective on 30 January 2013 unless they are called in by the Overview & Scrutiny Business Panel on 29 January 2013. (vi) on the basis of the appraisal of the options set out and having considered the further information including the required further financial and technical assessments set out, option 2 should be pursued. 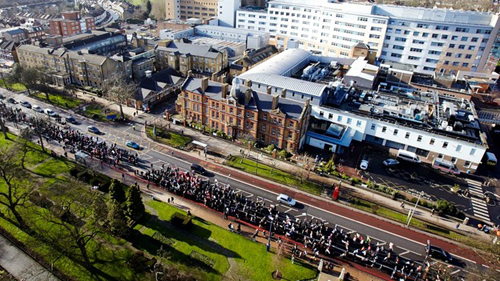 Aerial shot provided to ITV and BBC © Lewisham NHS Trust. All other pix by Crosswhatfields unless otherwise credited. Does anyone know where A&E is? 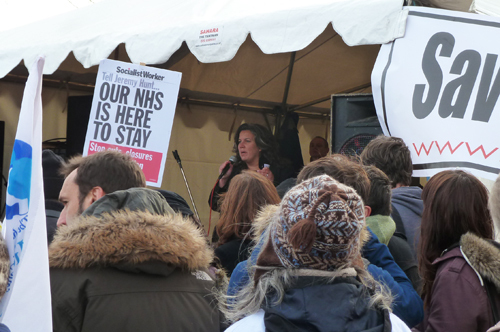 Heidi Alexander (MP Lewisham East) spoke at the rally soon after Nick Ferrari from LBC (a Lewisham resident whose son was in the hospital the night before). We missed earlier speakers. 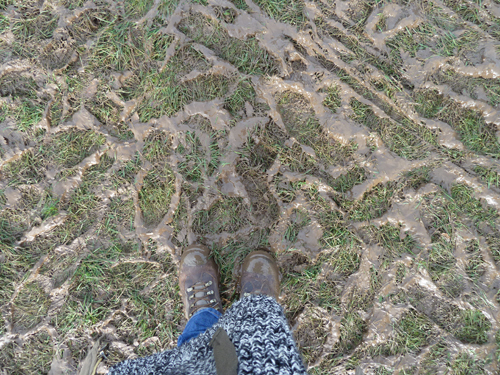 Meanwhile people were still arriving at the park (and finding it a bit muddy). 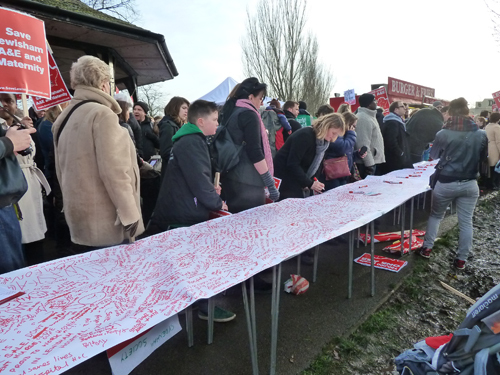 A 100ft long petition (which ended up as 200ft since both sides were used) to be delivered to Jeremy Hunt this week. 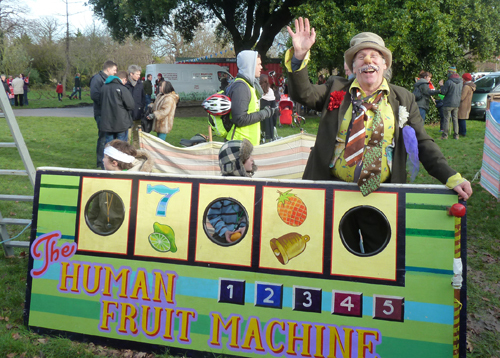 Local clown Dr Burnheart Gloss and his volunteers entertained the marchers with Splat The Rat, The Human Fruit Machine and a Coconut Shy refigured to target Health Secretary Jeremy Hunt. 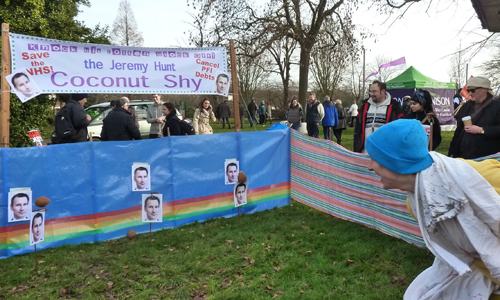 The coconut shy was extremely popular, with folk queuing up to "knock his rotten block off". 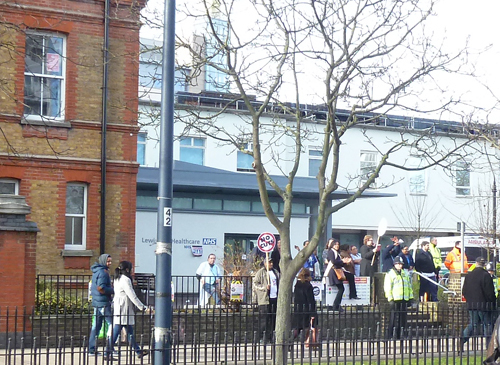 Hunt has become a target for protesters since he refused to meet with Lewisham GPs – and has previously insisted no A&Es should be closed purely to save cash, so any decision to cut services in Lewisham would be an embarrassing U-turn. 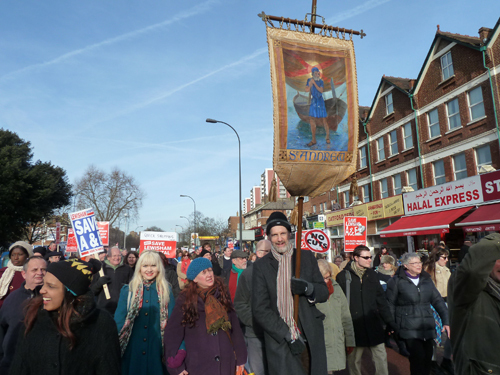 He will also face criticism if he decides to save Lewisham’s A&E because the consultation process which led to the recommendations ran 25 per cent over budget and cost taxpayers £5.1 million. See more reports of the demonstration from Transpontine and Channel 4. 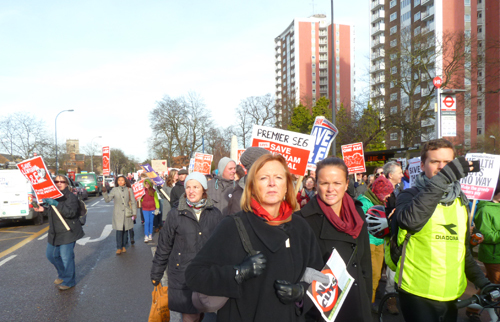 Also see East London Lines and more pics and news of media coverage on Save Lewisham Hospital's website. 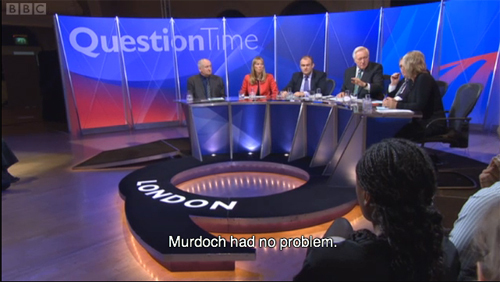 ITV and Radio 4 also had good coverage, but BBC TV disappointed. Some great pictures from the Daily Express (?!) here. 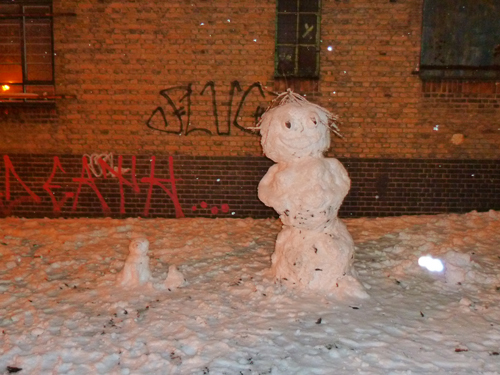 Also see Andy Worthington's pictures and words here plus pics and video from Alternative SE4. 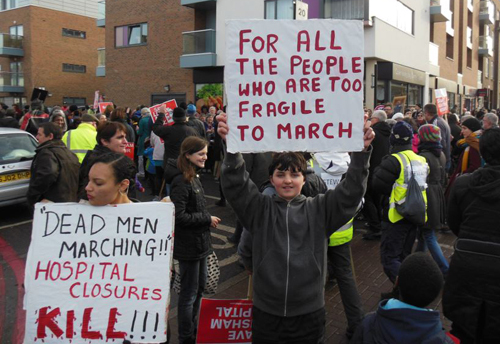 Good stories leading up to the march in The Guardian here and here. many of them very good hospitals." 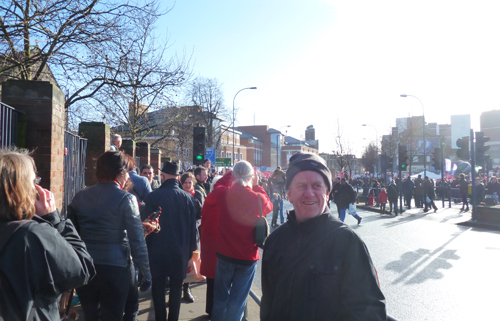 Finally, BIG thanks to all who helped to organise the march. You are amazing! Sound the battle cry! 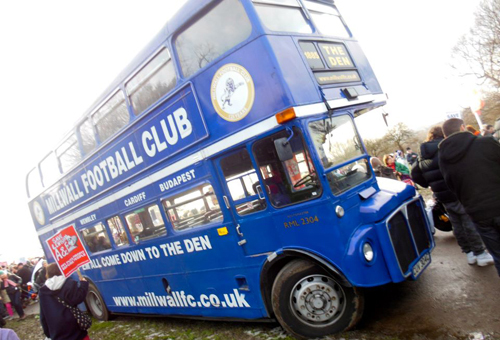 Even Millwall has brought forward its game with Villa in order not to clash with the march tomorrow. Meanwhile the number of online petition signatures nears the 30,000 mark (see panel right). Transpontine has written a great article here to get you in the mood. Also see Millwall's statement on their website. 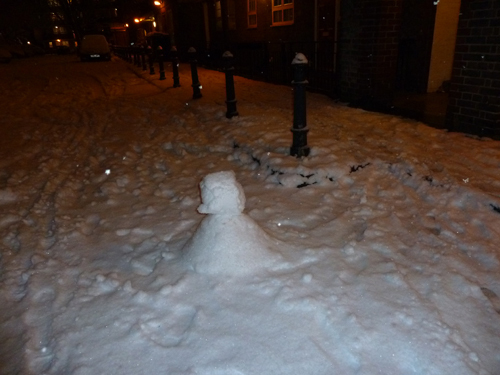 Housing Matters Update – a foredrawn conclusion? So what was all that about? No new information can be found listed in the Housing Matters section of the council's website, nor on the TPAS (Tenants Participation Advisory Service) webpage dedicated to the monitoring work it undertook in the Housing Matters consultation. But a draft report of TPAS's findings can be found, as an appendix, in the agenda of the Housing Select Committee, 8th Jan 2013. To read TPAS's report in full, click here. TPAS found that residents' preferred options were to either to stay with Lewisham Homes or return to Council management (Options 1 & 2). Mostly the latter. 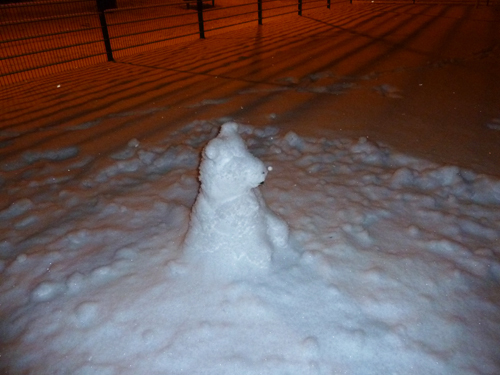 It might have been that residents were only really comfortable commenting on the things they have experience of. Quite a low satisfaction rate with Lewisham Homes' management could be recorded, in a different questionnaire, ditto the Council, but perhaps it was a case of "better the devil you know" that resulted in the popularity of both Options 1 & 2. 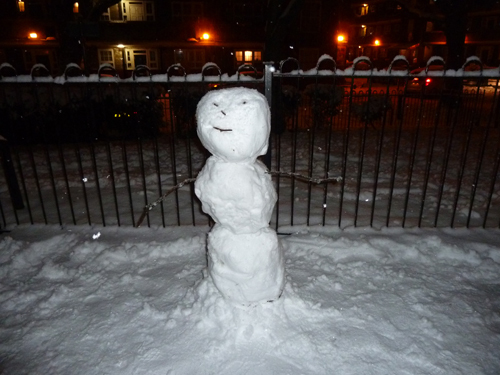 More information was required – than the Council was able to provide – for consideration of Option 3 (stock transfer from the council to Lewisham Homes, which would become a 'Resident-led' / 'Gateway' / 'Mutual' organisation with the ability to borrow more money to build more housing). There was "little or no appetite" for Option 4 (stock transfer to a Housing Association). Residents' legitimate fear of rises in rent and service charges made Option 4 objectionable, and for many, the 'resident-led' component of Option 3 didn't really alleviate those fears, despite the promises. Perhaps people were wisely indicating their preference for a more cautious approach in a time of instability, spending cuts, benefit cuts and a triple dip recession. The RSG (Resident Steering Group), who were the most closely involved in the consultation, ranked 'building new homes' joint seventh with 'maximising tenant control and influence' in order of importance when considering the factors involved. Top of their list was preserving tenants' rights. However, half of them came out in favour of Option 3. The Key Findings of TPAS's monitoring of the consultation are listed at the bottom of this post. Meanwhile, in their financial analysis of the relative benefits of stock transfer (Option 3) versus retention (Options 1 & 2), TPAS "identified a significant number of issues to be resolved before robust figures on the financial benefits of transfer (or otherwise) can be established". They found "uncertainties" in the transfer business plan projections "that would require external validation and a degree of reworking, before the Council can safely assume that the additional resources projected are indeed available". TPAS suggests the Council does this work before pursuing the stock transfer option. They also identified alternative and further, possibly better, ways to make the most of the money available should the Council choose to retain its stock. 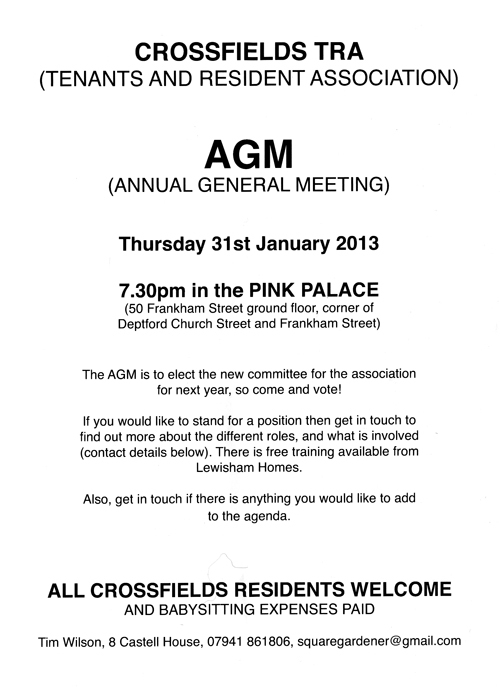 On 16th January 2013, Mayor and Cabinet will be deciding what to do next (see the agenda). The Council's own report, Housing Matters Update, which includes specific recommendations, can found here. In this report, Option 4 has been removed from the list of options (it should never have really been there in the first place and just confused and frightened people). Although the findings of the consultation indicated residents would prefer no change at all or have their homes come back under the care of the Council, this has been interpreted by the Council as overall approval for Lewisham Homes. 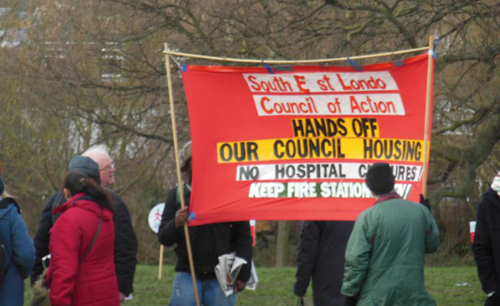 The Council now feels it has a mandate to pursue Option 3 – a stock transfer to Lewisham Homes. 6.1. The conversation with residents to date has shown a high level of satisfaction with Lewisham Homes and a preference for Lewisham Homes to continue to manage homes and for the Council to continue as landlord. However, residents do agree with the Council’s priorities and do think that it is right that the Council considers options which attract more investment for their homes and estates. 2. 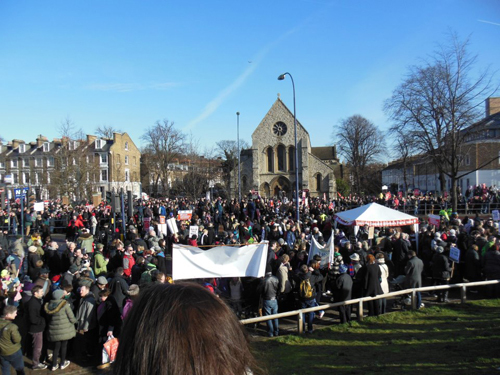 Work alongside residents, Lewisham Homes and other bodies to better understand how, by retaining but evolving Lewisham Homes – with a view to a possible transfer of ownership to Lewisham Homes as a resident-led organisation – it might attract further investment, increase resident control, deliver residents’ aspirations and address their concerns. The report recommends that the latter option (the new 'Option 2') is further pursued. This is also what Lewisham Homes itself wants. If Mayor and Cabinet follow this recommendation, this will mean yet further consultation with us. According to the report, 1500 forms (out of a potential 17-18,000, about 8%) were returned in this last survey, but were apparently unrepresentative because not enough Black households responded and too many people over 60 did (draw your own conclusions). The Council officer's report advised that the Council would have to develop "a new Consultation Strategy" that ensured "its outcomes are reflective and representative of its community." TPAS's report records the vast range of techniques employed to engage people this last time round, most of which were met with disinterest. They are not so disingenous as to describe this as 'apathy', nor political enough to use the word 'disenfranchised' – they don't attempt to explain it at all. But, ironically, one of the main reasons why people do not respond to such consultations is that they think the Council will do what it wants to do, regardless of their opinion. 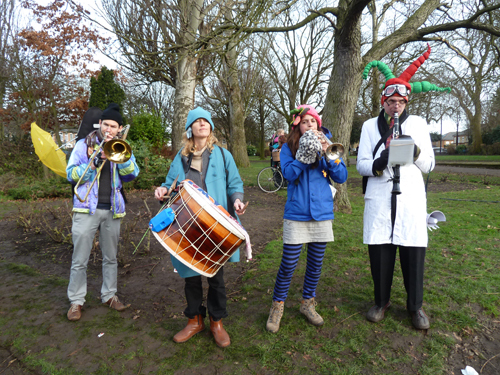 The Council called this last consultation 'a conversation', perhaps knowing that it would be ill-prepared and poorly executed, and intending it as a (rather expensive) rehearsal. Consultation with secure tenants is a requirement of Section 105 of the Housing Act 1985, but if the new 'Option 2' is ratified on 16 January, the future 'conversations' may well be more a case of educating us on a foregone conclusion so that it won't be such a shock when it happens, or selling us the idea until we finally buy it. What should be clear from this recent 'conversation' is that unless people like TPAS are around all the time knocking on doors and trying to explain complicated housing matters to people who're busy trying to survive a recession, they can expect considerably less than 8% of 'resident involvement' in any 'resident-led' initiative such as the new Option 2. Just as happens now, rents and service charges will have to include a fee to pay an army of staff to 'get people involved', to result in a possible 1% of residents involved in the running of the organisation. In many of the recent consultation events, there were more staff than residents. 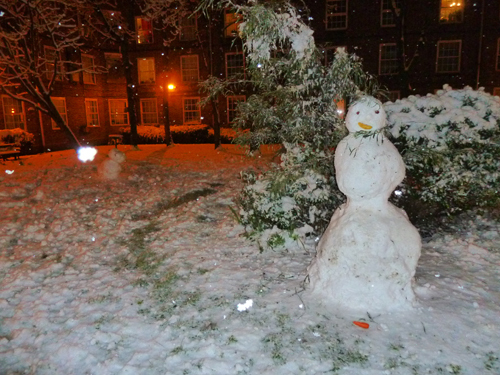 Where are the figures on present resident involvement? 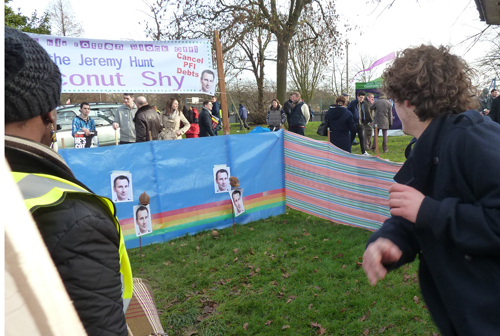 What are the levels of satisfaction of those taking part? How does the information 'trickle down' to non-participants? Answer: it doesn't. 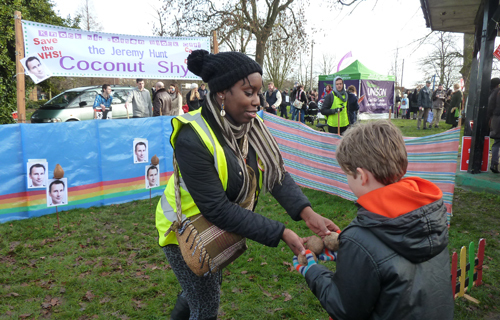 Why does Lewisham Homes think it has a convincing model for successful resident participation? According to the report, whilst this new consultation strategy is being designed, the Council and Lewisham Homes would work with various government agencies (and probably overpaid consultants) to determine the benefits and implications of transferring its stock to Lewisham Homes, since "there are presently unquantifiable variables that have the potential to impact on the precise level of funding available to a transfer organisation". (VAT exemption is just one of the many things that hasn't been thought through). TPAS have said they should work all this out before they come back to us with further options. No one can really object to the noble aims of building more affordable housing, and you might want to support the Council's objectives despite the inevitable expenditure occurred in scoping such a huge ambition. But you may still be wondering where, in this already crowded borough (especially in Deptford), they will find the space to build it. The Council's report states that they employed the services of PTEa architects and real estate consultants Drivers Jonas Deloitte* to identify suitable sites "details of which are provided in Part Two of this report". Some of the land options available are said to be time limited and require decisions to be made very soon. However, Part Two of this report does not appear to be publicly available (draw your own conclusions). • There are real concerns about security of tenure and maintaining existing tenancy rights. • The majority of the residents that we spoke to expressed the desire to remain with Lewisham Homes or return to the Council. • Many of the residents that we spoke to expressed concern about the short time frame of the project. • Residents that we spoke to often felt that they had insufficient information to give an informed opinion. • Our financial analysis shows Lewisham to be in a more favourable position than many councils find themselves, and one which enables an “unpressurised” choice between the proposed options. • Careful consideration needs to be given to ensure appropriate consultation when dealing with residents living in Sheltered Housing Schemes. Any consultation must be well planned and timely due to the vulnerable nature of many of the residents living in these schemes. 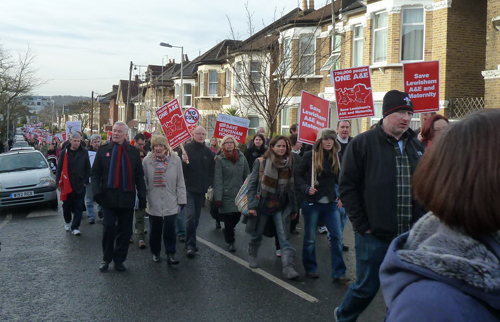 • Lewisham Homes have stated that their preferred option is to become a 'Mutual' Organisation. 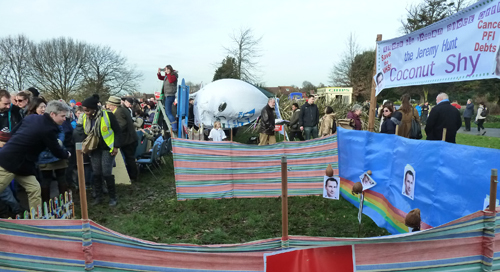 TPAS also noted that a number of tenants had observed during the consultation process that it seemed odd for the council to be considering transfer, when the main shortfall in funding was caused by their desire to build new council homes, which after transfer would no longer be council homes. Meanwhile, here's more sobering reading about the Council's spending commitments in other areas: see Alternative SE4's latest post "Lewisham PFI Contract Liabilities of £1.2bn set to blow hole in future budgets". If you missed the programme, you can view it for another year on iPlayer here. 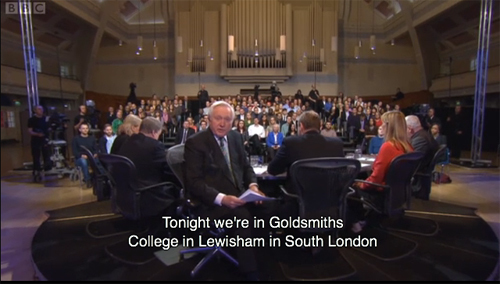 The debate on Lewisham Hospital takes up much of the last third of the programme. 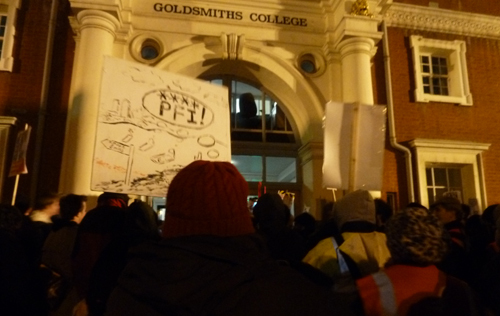 A small but lively (and very noisy) protest took place outside Goldsmiths' main building on Thursday whilst the BBC Question Time audience were being rehearsed just inside in the main hall. 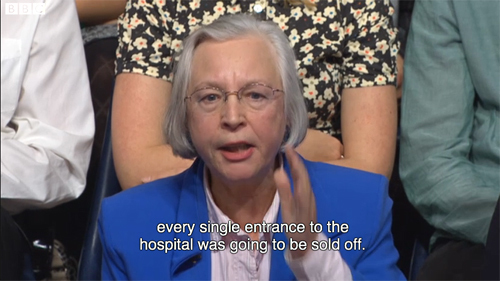 The protest was filmed by the Beeb and could be heard inside, inspiring the campaigners who were part of the audience to lobby the panel before the show began. 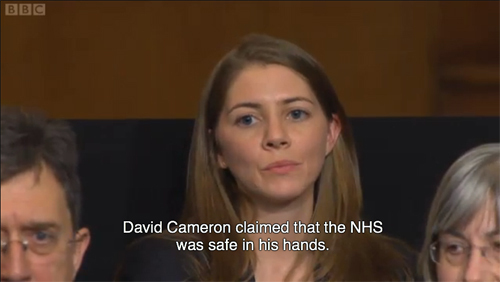 This resulted in some of the panel speaking in support of saving the hospital when the question came up. Though it is doubtful how much influence she has, disgraced MP Nadine Dorries promised to arrange for the campaigners to meet Jeremy Hunt, even though he has so far refused to meet Heidi Alexander and others who have repeatedly requested meetings with him. The producers had previously told us the subject was too local to be of interest, but news that day of more proposed closures, plus the protest outside, and a wonderfully simple question from local Kate Hennessy that linked our local issue to the larger national one ("David Cameron claimed the NHS was safe in his hands...given the cuts and closures around the country is this still the case?") 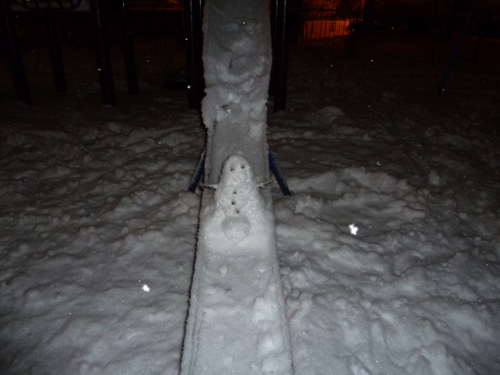 meant it got a full airing. Dorries took the opportunity to blame Labour for the terrible PFI deals it struck, and John Prescott blithered and blathered at Ed Davey, whilst Dimbleby pinned Davey down on statements he made that he had obviously not been briefed on. Davey's statements caused an elderly campaigner, perhaps a doctor herself, to point out how the views of clinicians, GPs and the community had been "deliberately ignored" in the consultation. 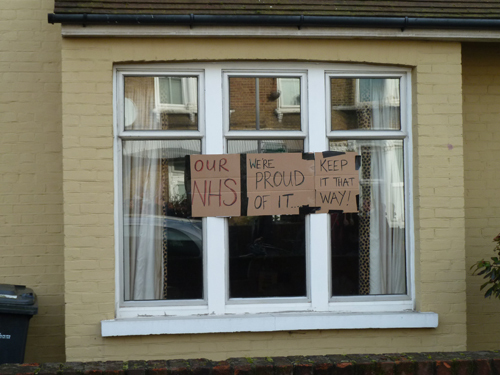 She revealed that the plan for Lewisham Hospital "was hidden away in an annex to an appendix in the draft report", details of which were not included in the consultation document. It revealed that "every single entrance to the hospital was going to be sold off and our brand new A&E, maternity care and urgent care centre were all part of the land that was going to be sold off". 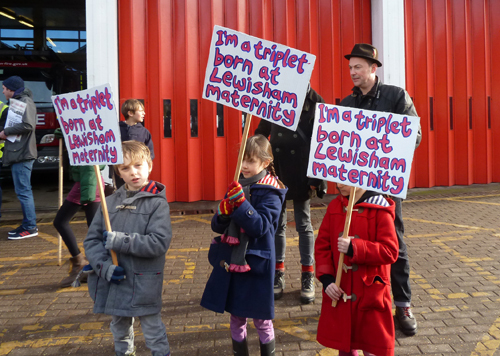 A Lewisham hospital paediatrician said "The coalition government broke its pledge not to introduce any top-down change by introducing the biggest top-down ever, the Health & Social Care Bill. It's the biggest ever change introduced in the NHS...the Coalition is pushing on more than £20 billion pounds worth of savings over the next three years. 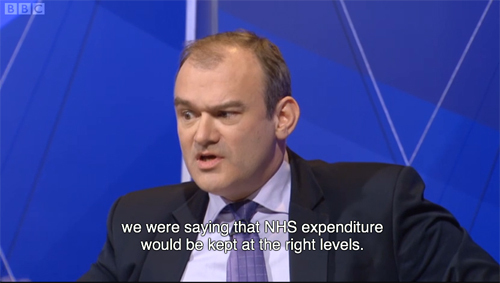 NHS funding is about £85billion. That gives you some perspective about it. A safe hospital, locally, is about to close. Now make a judgement. 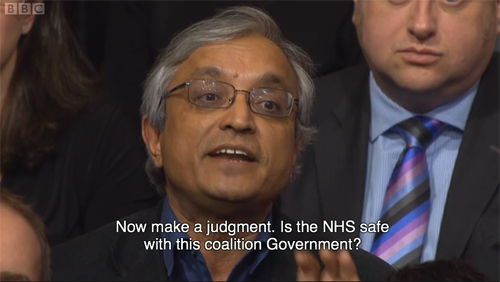 Is the NHS safe with this coalition Government?" 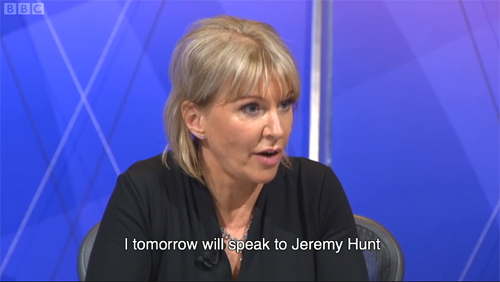 Since Nadine Dorries had promised to call Jeremy Hunt "tomorrow" then admitted she would be busy in her constituency so would have to text him instead, the debate drew to a close with an audience member pinning Nadine Dorries down to her promise of help, by asking her to set up a meeting for them. 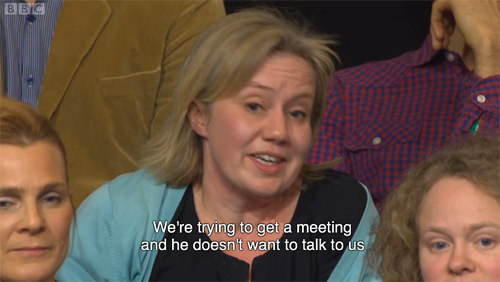 Dimbleby suggested they all meet after the programme, whilst Prescott reminded us that some people don't have any difficulty getting meetings with Jeremy Hunt. "Murdoch had no problem," he grumbled in a parting shot, intent on reminding us what sort of errors of judgement the person who holds the fate of our local hospital in his hands has made in the past. Also see Transpontine for a further report of this evening. 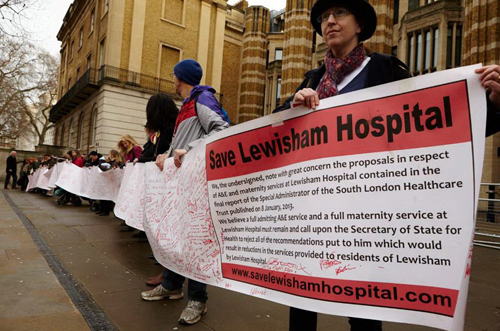 The campaign to save Lewisham Hospital is also asking that you let the Secretary of State know what you think by sending your views directly to him. Email Jeremy Hunt at mb-sofs@dh.gsi.gov.uk or write to him at Rt Hon Jeremy Hunt MP, Secretary of State for Health, Department for Health, Richmond House, 79 Whitehall, London SW1A 2NS. See our previous report on the Special Administrator's overspending here. 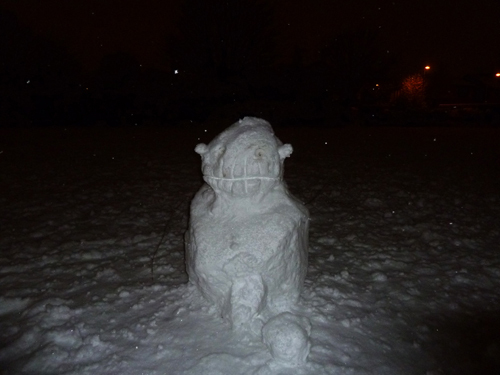 Faircharm Creative Quarter – deadline 7th Jan!